Adventure Films, the producers of well known tourist guides on video "The Botswana Adventure" & "Discover Mozambique" now offers their new production "The Zimbabwe Adventure – Kariba & The Zambezi" for potential visitors to this beautiful country. The adventure starts at the Town of Kariba, better known as Zimbabwe's Riviera, where we explore the lake, accommodation and campsites on offer, in and around the town. We then headed north-east to The Zambezi valley and Mana Pools National Park, set in one of the most untamed areas in the country where tourists are still allowed to explore the park on foot. We return to Kariba from where we charter a ferry to our next destination, Matusadona National Park. This unique reserve is set on the shores of Lake Kariba with beautiful camping sites and chalets and has been declared an intensive protection zone for the dwindling numbers of black rhino. Matusadona can either be reached by ferry / boat or car. We end this part of our adventure in the town of Binga, on the shores of Lake Kariba, where beautiful lodges and camping sites can be found. An ideal place to wash down the dust and relax after an exciting adventure. The video is not a wildlife film. 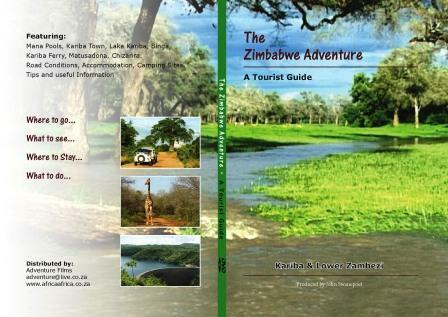 The purpose of the production is to inform potential visitors to Zimbabwe about relative aspects that could assist them in planning their 4X4 adventure. Topics featured are National Parks, relevant towns, hotels & lodges, camping sites, road conditions and useful tips regarding your adventure.